Win a load of Cadbury’s Chocolates! Enter our free prize draw today to win all these sweets from Cadbury All you have to do is follow and retweet us on Twitter – it’s that simple! Click here to visit our Twitter page and click the FOLLOW button to follow us…. The prize consists of 1 x 200g Milk Tray Box, 1 x 200g Roses Carton, 1 x 120g Cadbury Dairy Milk Bar, 1 x 120g Cadbury Turkish Bar, 1 x 120g Cadbury Caramel Bar, Dairy Milk, Whole Nut, Fruit & Nut, Dream, Bournville, Crunchie, Time Out, Flake, Curly Wurly, Picnic, Buttons, Wispa, Boost, Double Decker, Star Bar and Chomp. The closing date for entries is Wednesday 23rd April at 4.00pm and the winner will be selected at random on the same day and notified via Twitter. For full terms and conditions please see below. 1. The prize draw closes at 4.00pm on Wednesday 23rd April 2014. 2. 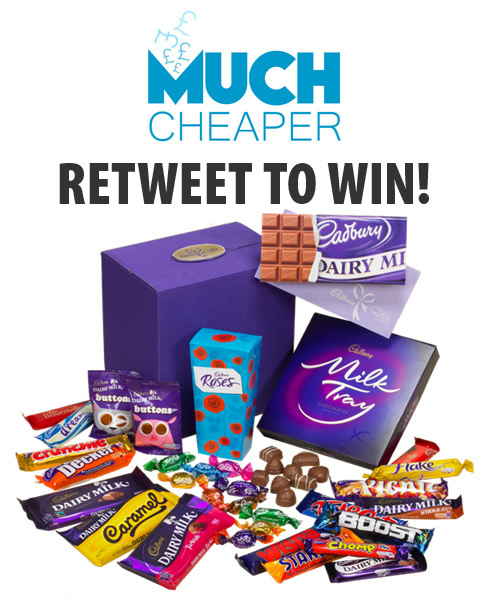 To enter the draw, entrants must follow Much Cheaper on Twitter and retweet “Win a load of Cadbury’s Chocolate with @muchcheaper! Retweet to enter. T&Cs http://www.muchcheaper.co.uk/competition/ #competition”. 3. Winners will be notified on Twitter by 6.00pm on Wednesday 23rd April 2014. 4. The winner will receive a Sweet Tree as shown in the picture. There are no-runners-up prizes. The decision of the judges is final and no correspondence or discussion shall be entered into. 1. The winner will be picked at random. 2. The re-tweet may not contain libellous, sexually explicit, disparaging or other inappropriate content. 3. No entry may contain unlawful, obscene or objectionable material. Muchcheaper.co.uk also reserves the right at any time during the prize draw to remove or disqualify any tweet when it believes in its sole discretion that the entrant has: (i) infringed any third party’s copyright; (ii) does not comply with these Terms and Conditions; (iii) failed to obtain the necessary consents as set out in these terms and conditions. 4. Employees of Muchcheaper.co.uk directly associated with this prize draw and their immediate families or those living in the same household of each such employee are not eligible to enter this prize draw. 5. Muchcheaper.co.uk is not responsible for incorrect e-mail or postal addresses or for problems with entries or claims caused by any factors outside of their control. 6. Arrangements for the delivery of the prize will be made with the winner by twitter, facebook or email. 7. This prize draw is only open to residents of the United Kingdom. Entrants must be over 18 years of age. 8. By entering this prize draw, entrants agree that Muchcheaper.co.uk may showcase their tweets on Muchcheaper.co.uk website and any other media in connection with the prize draw and use their names, profile photographs and/or biographical information (as it appears on Twitter or Facebook) for advertising, publicity and promotional purposes without compensation. 9. The entrant agrees that Muchcheaper.co.uk shall not be liable for any claims, costs, liabilities, damages, expenses and losses arising out of (i) Muchcheaper.co.uk’s use of the entrant’s tweet or facebook post; (ii) the entrant’s participation in the prize draw; (iii) technical failures of any kind including but not limited to problems or delays arising from software or equipment malfunctions or computer viruses; (iv) any events outside Muchcheaper.co.uk’s reasonable control. Nothing in this clause shall be construed to exclude or limit Muchcheaper.co.uk’s liability for death or personal injury caused by negligence or any other liability which by law cannot be excluded or limited. 10. This Agreement shall be governed by and construed in accordance with English law and the Parties submit to the exclusive jurisdiction of the courts of England and Wales. 12. Muchcheaper.co.uk reserves the right to amend these rules at any time. Muchcheaper.co.uk may also create rules which will apply to a specific prize draw only. If we do this we will publish the amended competition rules and/or specific competition rules on this page.